No one wants to pull into the parking lot at their typical nine to five office job and see a barren or rugged-looking landscape. Some of the most successful companies in the world understand that it isn't just important to have a great internal work atmosphere, but also an aesthetically pleasing building in order to keep employees happy and improve company image. The American landscaping industry has around 401, 473 businesses and 888, 462 employees scattered throughout the nation that are always willing to take on the challenge of working on a commercial landscape design. Businesses may wonder what commercial landscaping ideas are the most economical. Generally, properly selected, placed, and well-maintained landscaping plants can provide wind protection, therefore reducing heating costs. For those living in a warmer climate, plants stationed closer to the building can reduce air conditioning costs. Below are five great design ideas that a profession commercial landscaping service can produce. Focus on the facade of the building. Welcome both employees and clients with a stunning and sophisticated entrance to the company. It is important not to go completely overboard here, so be sure to include a few lush, overgrown green filler plants that will serve as a guide to the front door. Adding a pop of color makes one memorable. After designing a facade, consult your professional landscaper and figure out what types of colorful, yet affordable, flowers to place around the building. For a lower cost, opt for perennial local species. The colorful plants work well in areas where a bench might be placed for employees. Having a few benches strategically placed around the company grounds is a great way to get your employees outside for some fresh air - and as an added bonus they will enjoy the perfectly laid out commercial landscaping design. Let the outdoor furniture mimic or complement the building's interior furniture. There are plenty of options from sleek and modern to antique and rustic. Save room for growing and maturing plants. The building may be new and everything fits just right indoors, but know that plants need room to grow! Professional landscapers will know to properly space out trees and larger shrubs, yet always ask for a finished layout before giving the go-ahead to start the project. Note that some species of plants or trees are very thick and may obstruct the view of entrances. Thinking about adding some sustainability to the company's list of commercial landscaping ideas will end up decreasing overall costs in the long run. As mentioned, look for local species of trees and plants. Other options include installing irrigation channels in order to funnel rainwater to areas that need it most. In warmer climates, the trend now is to use gravel and weather-resistant plants such as cacti. 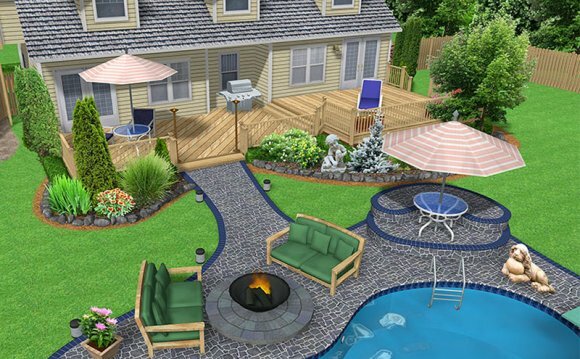 Note that the landscaping process will be a long one, and may consist of sod laying, mowing, trimming, planting, watering, fertilizing, digging, raking, a sprinkler system, or the installation of retaining walls.